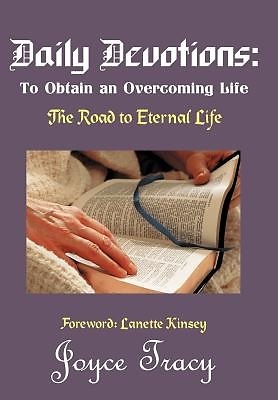 To Obtain an Overcoming Life is a series of devotions on how to overcome the negative traits and behaviors in our life such as; fear, pride, temptation, finding fault, jealousy, making excuses, rebellion and self, or selfishness. These are very important and valuable as they teach us how to obtain the power to live a victorious life in Christ Jesus. It begins with self for unless we can overcome self we won't be able to overcome other negative traits, as all hinge on self. There are devotions on making right choices and how to set goals and priorities; about attitudes and faith, having a continuous praise in our heart to the Lord and how to obtain our final reward in heaven - thus the 'Road to Eternal Life. 'As we strive for the Kingdom, we have mountains to climb and valleys to cross, we're faced with hills and barriers, and each step has a new name. They are there to keep us out of 'Heaven's territory.' We must over - come and step - over; failures and past failures, handicaps of every kind, peer pressure, fear, anger, and defeat.Approximately two-thirds of Jesus' teachings were in parables. A parable is an earthly story with a spiritual or heavenly meaning, teaching Christian morals, principles and values. Many of these devotions will be based on some of these parables. Want it in two business days? Order by 4/23/2019 2:00:00 PM and choose Overnight shipping at checkout. Ships from a Cokesbury Connect Partner.